Riders braved the unseasonable weather on Saturday, June 27 to take on the Buckeye Bridge Ride. The BBR is presented by the non-profit organization called Friends of Preble County 4-H. The proceeds from the bike ride go directly into funding the Preble County 4-H camps and other activities. PREBLE COUNTY — It was an early start for those who rode in the 12th annual Buckeye Bridge Ride. 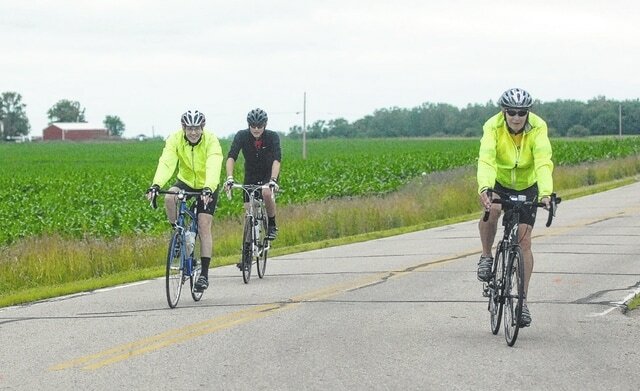 Riders began between 6-10 a.m., and the overcast day made for a nice and cool ride on the five different scenic routes which took in the eight covered bridges in Preble County. The five different routes depended upon the amount of mileage the riders wanted to attempt. The riders could pick an 18, 49, 62, 89, or 100 mile bike ride which would last most of the day. This year however, there was a new twist to the bicycle ride. “They have to eat two buckeyes at each stop, and hold them down and keep on riding,” Vonderhaar noted. The buckeyes weren’t just you’re average sized buckeyes either — the treat’s size was related to the stature of a small clenched fist. There were five stops to be made for the riders to attempt the buckeye challenge. Bikers who attempted the buckeye challenge also got a ten-minute time reduction for each buckeye they consumed. Placing and awards went to the top five ride lengths, with or without the buckeye challenge. The Buckeye Bridge Ride is presented by the non-profit organization called Friends of Preble County 4-H. The proceeds from the bike ride go directly into funding the Preble County 4-H camps and other activities. Some of those camps include the state leadership camp, and the Washington leadership camp. “It also helps to benefit miscellaneous things to help our program,” Karen Hamilton of Eaton said. For more information on the bike ride and the organization, visit www.buckeyebridgeride.org or www.friendsofpreblecounty4h.org .